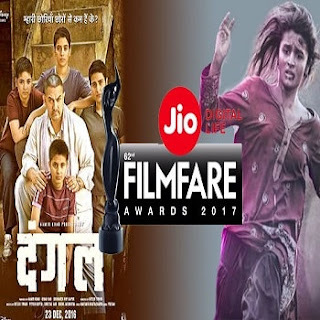 ü The Filmfare Awards are presented annually by The Times Group to honour both artistic and technical excellence of professionals in the Hindi language film industry of India. ü The Filmfare ceremony is one of the oldest film events in India. ü The awards were first introduced in 1954, the same year as the National Film Awards. ü These awards were initially referred to as the Clare Awards or The Clares after Clare Mendonca, the editor of The Times of India. ü Filmfare Awards are voted on by both the public and a committee of experts. ü Nominations of this award are decided by a jury comprising Bollywood personalities and organisers. » Critics’ Award For Best Actor (Male): Manoj Bajpayee (Aligarh) and Shahid Kapoor (Udta Punjab). » Filmfare Critics Award for Best Actor (Female): Sonam Kapoor for Neerja. » Best Actor (Male) in a Short Film: Manoj Bajpayee for Taandav. » Best Male Debut: Diljit Dosanjh for Udta Punjab. » Best Female Debut: Ritika Singh for Saala Khadoos. » Best Actor (Female) in a Short Film: Tisca Chopra for Chutney. » Best Dialogue: Ritesh Shah for Pink. » Best Screenplay: Shakun Batra, Ayesha Devitre Dhillon for Kapoor & Sons. » Best Story: Shakun Batra, Ayesha Devitre Dhillon for Kapoor & Sons. » Best Actor in a Supporting Role (Male): Rishi Kapoor for Kapoor & Sons.